He was the center on Fordham University’s famed “Seven Blocks of Granite” in the late 1930s, playing alongside another great name in football, guard Vince Lombardi. A No. 1 draft choice by the Detroit Lions in 1938, “Wojie” earned the “Iron Man” tag, playing on offense and defense for more than eight years. His seven passes intercepted in 1944 established a Detroit team record at the time. In 1946, he was traded to the Philadelphia Eagles where he played linebacker exclusively on the Eagles world champion teams in 1948 and 1949. “Wojie” retired after 13 years in the NFL. He was inducted into the Pro Football Hall of Fame in 1968. 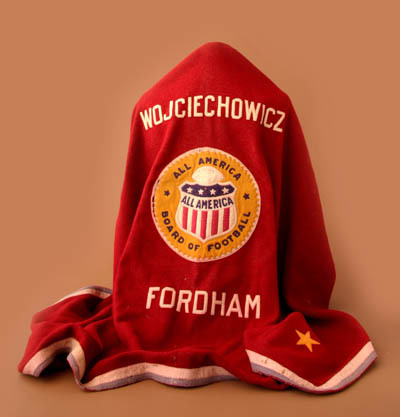 Wojie starred at Fordham University and became a legend as one of the famed “Seven Blocks of Granite” in the late 1930′s. He played center alongside a guard who was to become another great name in football history – Vince Lombardi. A No. 1 pick in 1938 of the Detroit Lions, Wojie played center, going both ways, for eight and a half seasons. In 1946, he was traded to Philadelphia where he became a dominant linebacker for the Eagles and enjoyed some of the greatest days of his career during his four and a half seasons with the organization. Wojciechowicz helped lead the Eagles to an Eastern Division title in 1947. This was followed by back-to-back World Championships in 1948 and 1949. Wojie played a key role for the Philadelphia team in both glorious seasons. When he played with the Lions, Wojie was a 60-minute, two way performer. However, with the Eagles he became a defensive specialist. “Greasy” Neale, the Eagles head coach at the time, built his defenses around the ace linebacker and the results spoke for themselves. The Eagles’ press book of 1948 described Wojciechowicz as “hard to dislodge; he loved the game rough.” He was also an excellent pass defender and for several years his seven passes intercepted in 1944 stood as a Detroit club record. The Redskins had Bones Taylor in 1947 and, in our opener, he caught five touchdown passes. So the next time we played Washington, I put Wojie on Bones. He did not catch a pass that day and he never caught a pass against us the next three years. Wojie made sure of that. Wojciechowicz retired at the age of 36, a veteran of 13 grueling NFL seasons. He left his mark on the game as one of pro football’s greatest and toughest players as well as one of the most noticeable last names ever! Alex Wojciechowicz was inducted into the Pro Football Hall of Fame in 1968.